Hello. I hope that you have had a lovely weekend. My husband has been up to another weekend project. This weekend hubby has painted my daughter's cubby house. The weather has been a bit over cast here today so I do not have any photos of the finished project. Instead, I have some cute photos of the cubby house before hubby painted the blue and red trims. Hubby was able to use the white paint left over from his pool storage box project (from his project last weekend). I was not able to take a photo of the other side of the cubby house because hubby was in the middle of painting the trims of the cubby house. 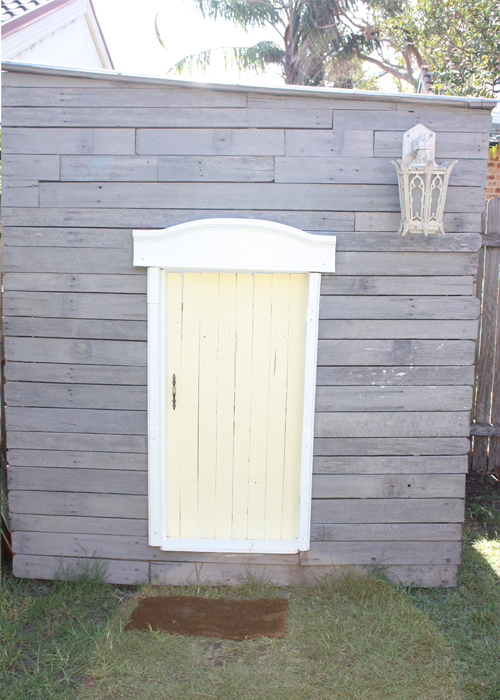 I am really happy with the way that this little cubby house has turned out. The little windows open up and my daughter and her friends love standing inside the cubby while they pretend they are working in a shop and serving me drinks and food. I am so impressed with hubby who has made this cubby all by himself over a couple of months - with nearly all the building materials being left over from when our new house was built. Go hubby! 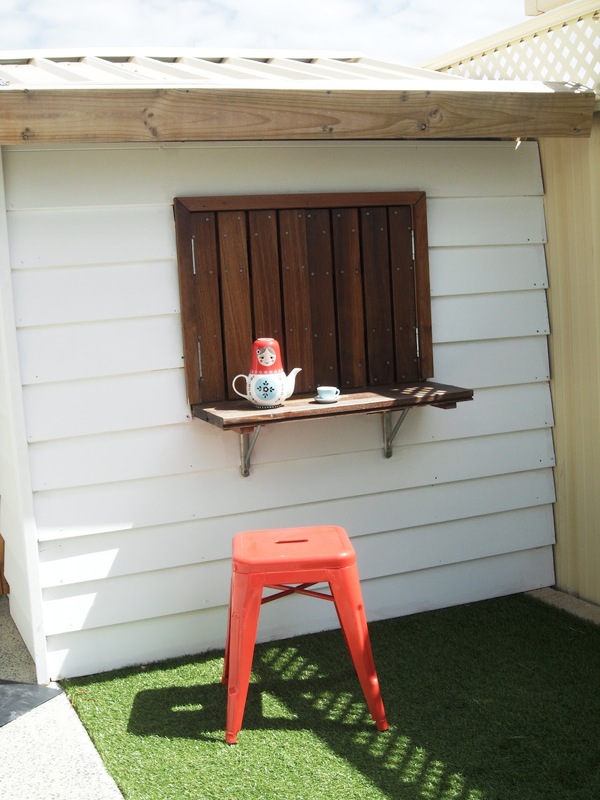 Some of our inspiration for this cubby house came from Belinda's kids cubby house from one of my favourite blogs - the happy home. 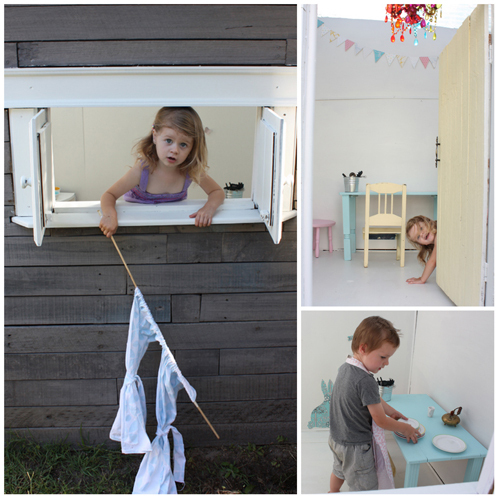 Here are some very pretty images from (the happy home blog) of the cubby that Belinda and her hubby built. 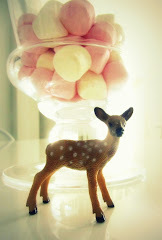 Thanks for the inspiration Belinda from the happy home blog. 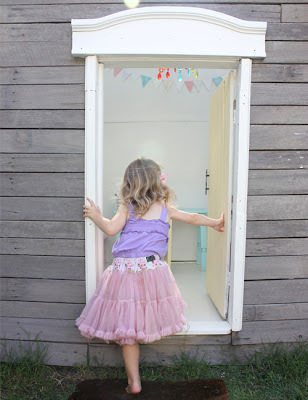 I will post some photos of my daughter's finished cubby sometime later this week (when the weather is a bit more sunny) and hopefully I will provide some inspiration to someone just like Belinda images have done for me! Sounds like your hubby works very hard around the house! Cubby house looks gorgeous. We might have to get your hubby over to build our little girl one. he he. Hubby sure does work hard! He loves keeping busy. Thanks Belinda! I will hopefully upload some more images of the cubby soon. My hubby found some great vinyl floor covering from Bunnings with a good old fashioned black and white tile look. I just need to find some time to neaten up the inside of the cubby (and maybe try a bit of styling). My little girl loves playing in the cubby so it is looking....well...very lived in!